The Dordogne department (department no 24) is in the Aquitaine region in the South West of France. The Dordogne area of France covered by this guide runs from Bergerac to Rocamadour in the south, and to Perigueux and Brantôme in the north, including a great deal of interesting and beautiful things to see in between, the Dordogne valley and Vezere valley encompassing the principle attractions. The area has little public transport, so you will need a car (or a bike or walking boots) to make the most of a holiday in the region. 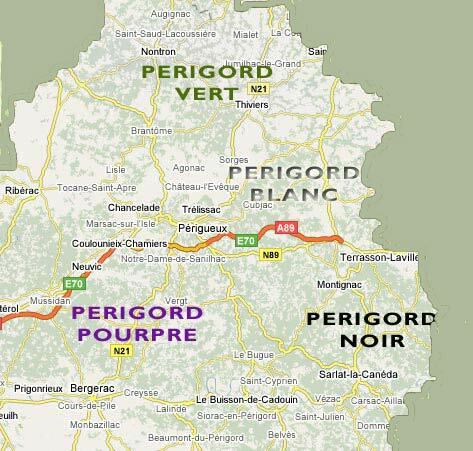 The Perigord Noir is the south-easterly part of the perigord and is named for the dark oak forests that cover much of the landscape. 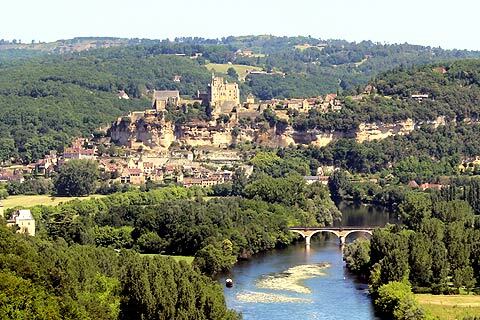 It is in the Perigord Noir that most of the highlights of the Dordogne area can be found. So many are concentrated into this area that we would recommend splitting your visit in to two. The first visit could encompass the lower Dordogne valley, the area between Saint Cyprien and Sarlat. Some of the many highlights of this visit will include canoeing on the Dordogne, visiting the most beautiful villages of Domme and Beynac and the magnificent castles along this stretch of the river. This visit could stretch further upstream (towards the east), along the Dordogne Valley from Sarlat to Rocamadour via Souillac. Be sure to see the caves at Gouffre de Padirac. See Perigord Noir. The second visit would cover the Vezere Valley from Le Bugue up to Montignac. The Vezere valley is home to an astonishing number of prehistoric caves and shelters as well as many charming towns and villages. Some of the many highlights of this visit will include visiting the caves at Lascaux and Font de Gaume and exploring the charming market towns of Le Bugue and Montignac. See Perigord Noir. The south west Perigord is known as the Perigord Pourpre for the vineyards that are common in this area. Highlights of the Perigord Pourpre include the lovely town of Bergerac with its historic centre and the beautiful village of Monpazier. The bastide towns of Beaumont and Eymet are also well worth a visit. The Chateau de Monbazillac is at the heart of the Monbazillac wine region, reknowned for its sweet white wine. See Perigord Pourpre. The Perigord Blanc is found in the centre of the Perigord area and is named for the white colour of the chalk soil. Here you will find the beautiful town of Perigueux with its beautifull multi-domed cathedral. The chateau de Neuvic and the Chateau de Montreal are both in this area. See Perigord Blanc. A visit to the Perigord Blanc could be linked to a visit to the Perigord Vert as there are fewer sights to see in these areas than the southern parts of the Dordogne. The Perigord Vert is the most northerly part of the Dordogne and is named for the green chestnut and oak forests common to the area. The stunning riverside village of Brantome is a must-see in this area as is the nearby village and chateau of Bourdeilles and the beautiful village of Saint-Jean-de Cole. Nontron and its famous knives is also worth a visit as is the market town of Riberac and the Dronne valley. See and Perigord Vert. A trip to the Perigord Vert could easily be combined with a trip to the Perigord Blanc. The reference to the Dordogne regions above as Perigord is based on their (common) classification using the historical name for the region. You can see these regions marked on the map above - essentially Nontron in the north is the centre of Perigord Vert; Perigueux is at the heart of Perigord Blanc in the centre of the region; Bergerac and the south-west part is known as Perigord Pourpre; and the region around Sarlat is often called Perigord Noir. On arriving, your first port of call should always be the local tourist office - most towns in the Dordogne have one - for up to date information about events for that period. All these different regions of the Dordogne area of France, from the Dordogne Valley in the south to the border with the Limousin in the north, are covered by this website. For the next part of your grand tour you will need to visit our Lot-et-Garonne website at southofthedordogne.com, for the many places of interest just to the south of the river and into the northern Lot-et-Garonne department.